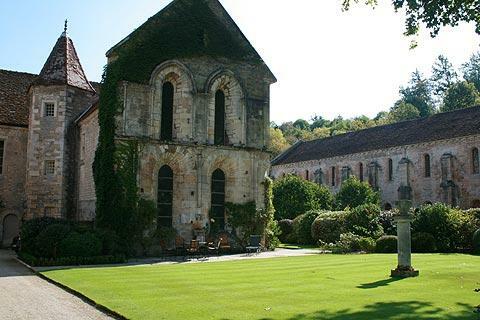 Fontenay Abbey is found six kilometres east of Montbard in the Burgundy region. 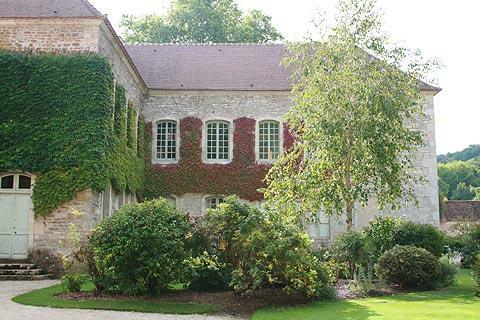 The abbey is privately owned, and open to visits - it receives approximately 100,000 visitors each year. 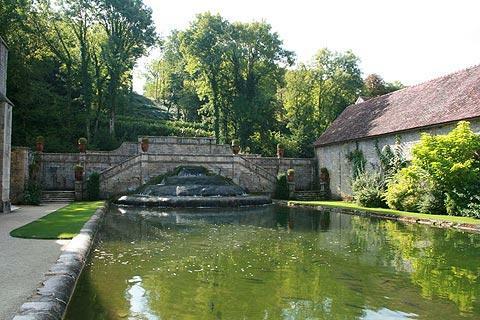 Not surprising because it is one of the great highlights of the Burgundy region. 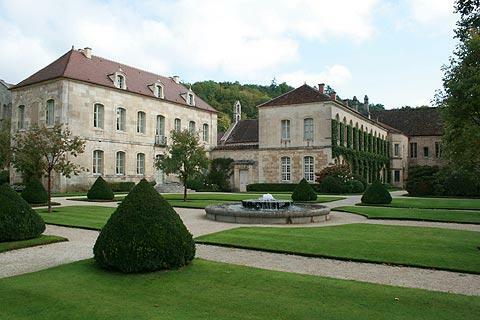 It is located in a very attractive wooded valley, and comprises about ten important and interesting buildings, set in extensive and very well managed gardens - largely formal in style, with the woods as backdrop. The location of the abbey in its wooded valley was very well chosen, with the babbling streams and shade being the perfect setting for quiet contemplation. 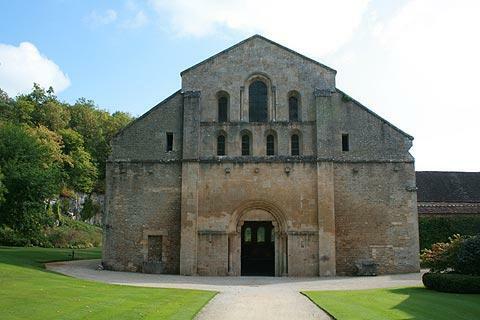 The cistercian abbey - the only intact monastery remaining in Burgundy - was founded in 1118 by Saint Bernard of Clairvaux. It's heyday was during the 12th and 13th centuries, but it fell into decline and was several times attacked and plundered during the later Hundred Years War and the wars of Religion (see history of France section). 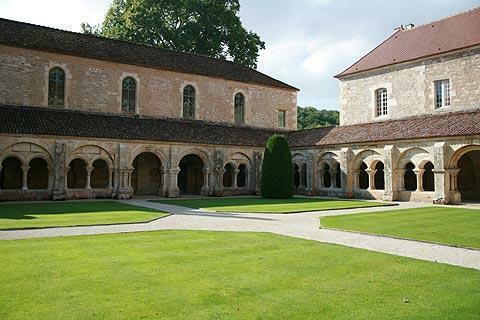 The abbey chuch was built in the middle of the 12th century, to a cruciform plan, and the beautiful cloisters were built around the same time. Activity as an abbey stopped with the French Revolution, but the abbey found new life as a paper mill, an activity which lasted until 1902. 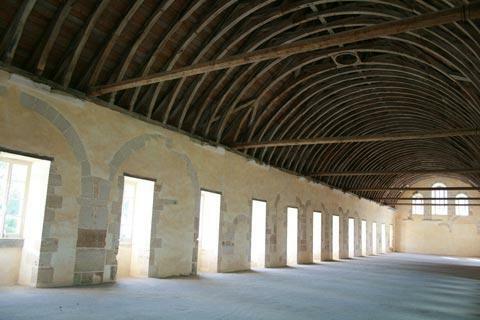 Restoration of the abbey started around 1905, and most of the original structures are restored (the refectory had been earlier demolished by the monks). 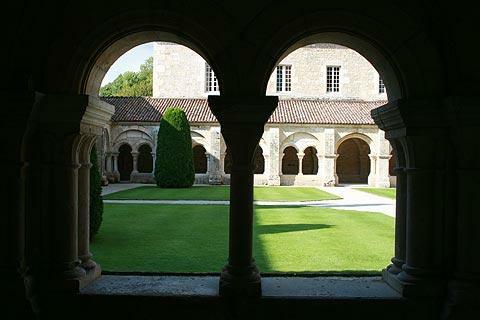 Fontenay Abbey is one of about 30 sites to appear on the UNESCO world heritage sites in France list. 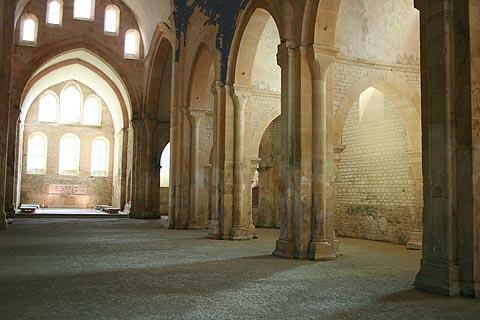 The Abbey church is large, calm, and constructed in the local white-pink stone, with the sturdy columns creating a large number of arches. The long dormitory is reached via a flight of stairs at one end of the church. With glimpses through the windows at the extensive gardens beyond, the outstanding feature of the dormitory is the unusual design of the roof structure, not unlike an upturned ship hull. 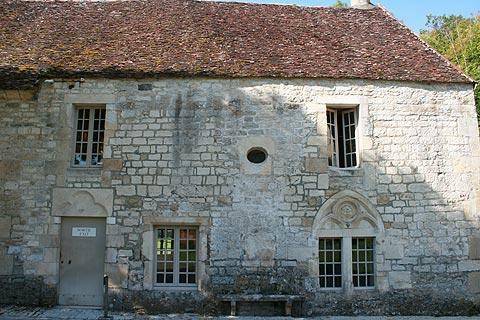 It is hard now to imagine the room in use, with rows of monks sleeping on mattresses on the floor. 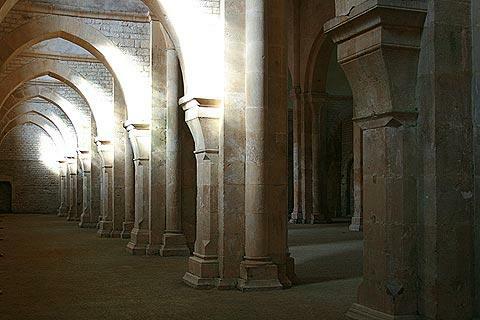 One of the finest cloisters I have seen, the 37 metre square cloisters are surrounded by simply decorated yet very beautiful stone arches, each containing further stone columns. 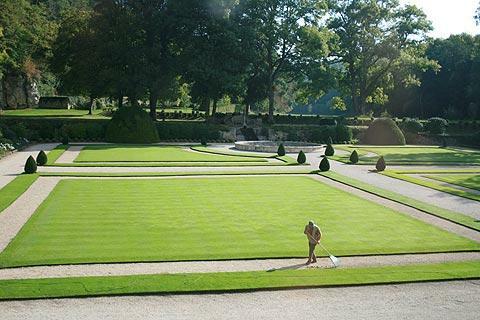 The gardens within the cloisters at Fontenay are now mostly laid to lawn. 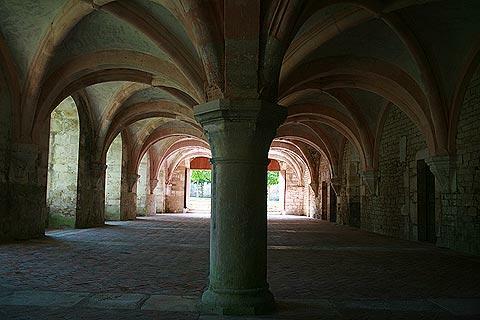 Below the dormitory there are two more rooms, joined by a doorway, with extensive stone arches - the Chapter Room and the Common Room. the Chapter room was used for meetings and for discussing chapters from the Bible (hence its name). 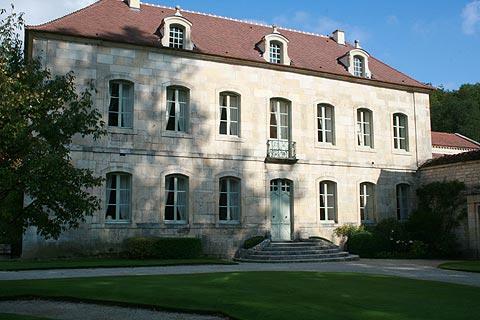 Much of the infirmary we now see at Fontenay, and its pretty garden in front, dates from the 18th century. 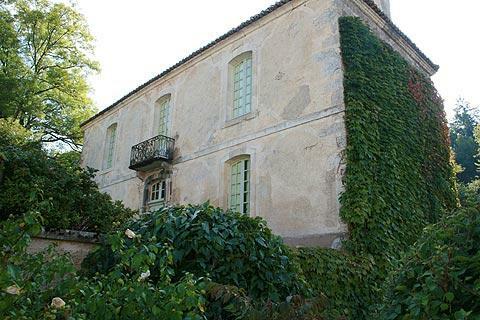 It was constructed on the site of an earlier, 12th century, building. It was also here that the monks grew the herbs necessary for producing their medicines. 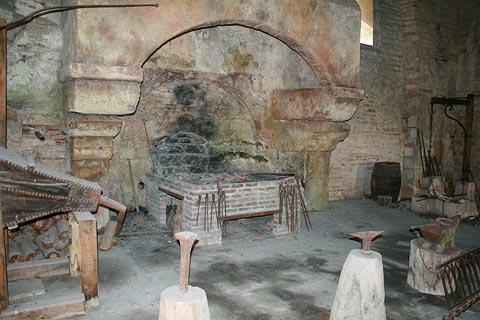 The forge, quiet and assuming as it appears today, was a great technological achievement being both the first metallurgical factory in Europe and also the first use of a hydraulic hammer - thus giving rise to the basic principles of iron production across Europe. The iron was produced here from rock quarried locally by the monks. You can see the equipment being operated by the stream that runs alongside the long building, and demonstrations of the entire process are also held regularly. Just outside the forge you can see a large shallow trout pond. 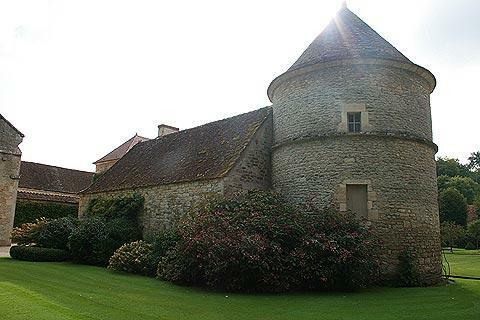 Among the other buildings to enjoy at Fontenay Abbey are a small 16th century building called the 'enfermerie' (original purpose unknown); the 19th century Galerie Seguin; the Abbotts Lodgin; the Dovecote; an entrance lodge and various others. 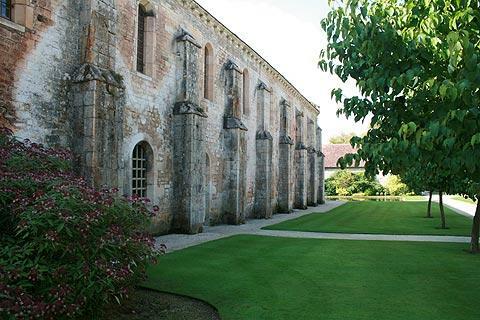 Many of these are scattered across the gardens in front of the main abbey buildings, also enhanced by several carefully pruned trees, and meticulous gardens. 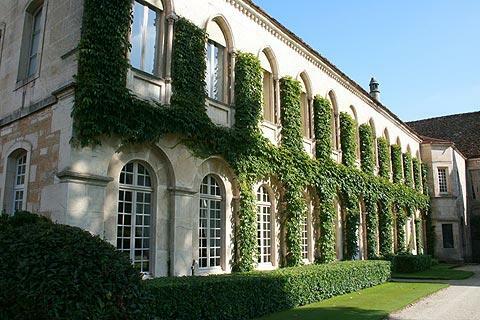 The gardens continue behind the main Fontenay buildings, with a very large formal garden running back into the woods that surround the abbey. 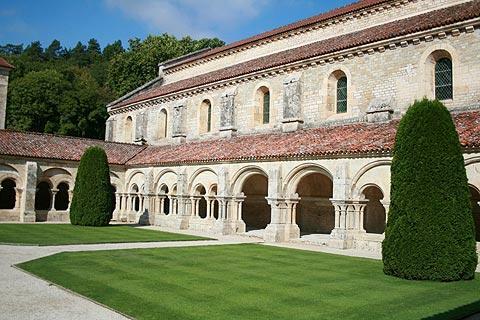 A visit to Fontenay Abbey can not be too highly recommended (admission price around 10 euros), and will surely form the highlight of your visit to this part of Burgundy. 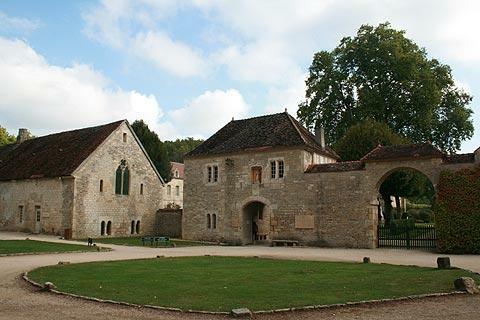 There is also a cafe on site, as well as a small museum presenting some artefacts and a large (and impressive) gift shop with books etc about the abbey. 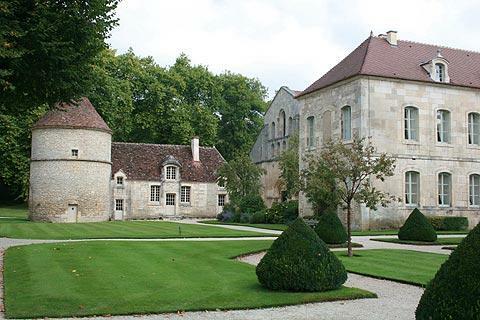 Nearby Montbard is not the most interesting town but there is a nice park to explore. 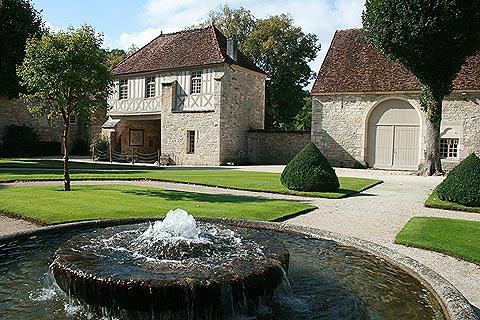 Not far south-east of Fontenay Abbey you can visit the small village of Flavigny and the small town of Semur-en-Auxois: both are very interesting and full of charm, and visits are recommended.